The newest generation of water soluble Cu-catalyzed azide-alkyne cycloaddition (CuAAC) ligands, providing dramatic increase to the rate of click reaction. Reagents are synthesized in-house to support the development of DIANA probes, but are also available for purchase to support range of click chemistry applications. BTTP belongs to the newest generation water soluble CuI-catalyzed azide-alkyne cycloaddition (CuAAC) ligands, providing dramatic increase to the rate of click reaction. BTTP outperforms the most common click ligand catalysts such as THPTA and TBTA by a large margin1,2. It has been shown3, that BTTP is also an excellent ligand in cellular experiments, taking down the concentration of the toxic copper even lower. 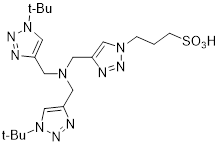 BTTPS belongs to the newest generation water soluble CuI-catalyzed azide-alkyne cycloaddition (CuAAC) ligands, providing dramatic increase to the rate of click reaction. BTTPS outperforms the most common click ligand catalysts such as THPTA and TBTA by a large margin1,2. 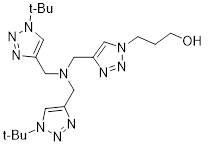 It has been shown3, that BTTPS is also an excellent ligand when targeting the click reaction on the membrane, since it does not cross this barrier.